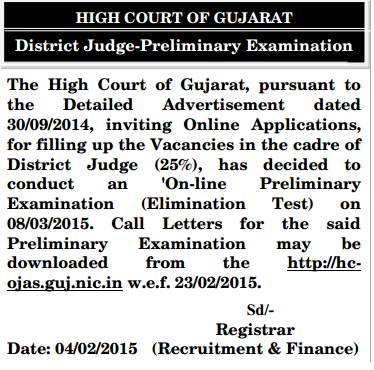 High Court of Gujrat had released notification advertisement no. RC/1250/2014 on 01st October 2014 for a total of 55 District Judges (24 Regular + 31 ad-hoc) vacancies / posts for Law graduate candidates which was required to fill online application till 31st October 2014. A huge numbers of candidates had applied for these posts. The High court of Gujrat has released notice regarding release of admit cards is going to release on 23rd February for written examination which is schedule on 08th March 2015. Those candidates who had applied for these posts and waiting for online admit cards, they can download admit cards for Online Pre-examination 2015 for District Judges on 23rd February 2015 on the official website. The official direct links to download admit card is provided in the end of the posts. Admit card is a mandatory card which contains information regarding date, venue and time of examination. It acts as entry card to appear into the examination hall to conduct online exam. No candidate will be allowed to appear in this ONLINE examination without Admit card. The Admit card is valid with photo identity proof i.e. PAN Card or Voter Card ID. It is suggested to the candidates that don’t bring any items other than Admit card, Original Photo Identity proof and pen/pencil to the examination hall. A rough sheet will be provided to the candidates for calculation purposes which will be submitted to the duty officers after completion of online pre-examination. · Enter Registration ID or Roll No. and Password or Date of Birth. · The Admit cards will be displayed on the screen. · Click on the link say save as pdf or print the admit cards. · Save and print the Admit cards Hard Copy for the exam requirements. The written Exam will be conducted on 08th March 2015. The Written EXAM 2015 will be conducted by Online MODE. In Online Mode, the exam will be entertained through filling of circles on Computer Generated Page known as OMR Sheet containing information of answers which will be selected by filling circle in it. The NO OMR sheet will be filled by Blue/Black ball point pen. A rough blank sheet will be issued for calculations/rough work in exam. The exam will be conducted two papers will be conducted each of 100 Marks which will be required to be completed within 2 Hours’.